Summer is here, and with it comes car trips, family gatherings, and other situations where a typical board game isn’t a great choice. What about a simple trivia game, or two? 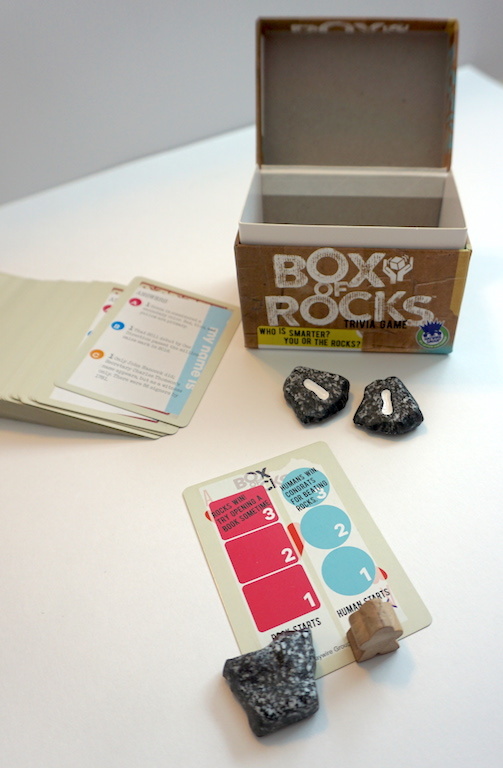 Box of Rocks and Parent Quiz are both simple trivia games published by Haywire Group. Both can be played in just a few minutes, and encourage discussion among the players. Which one is right for your family? Who is smarter: you, or a box of rocks? 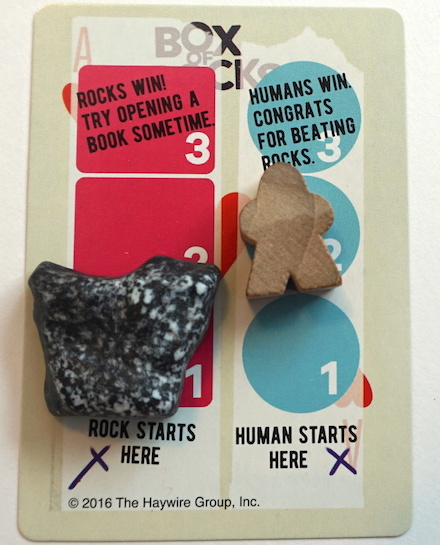 That is the intriguing and amusing concept behind the trivia game Box of Rocks. Open up the box and take out the cards. Pick a question and ask the group. The answer will always be 0, 1, or 2. Decide your answer, and then let the rocks “guess”, too. Close the box with the two marked rocks inside, shake it, and look inside. Count the rocks with marks showing face up (none, one rock, both rocks), and that is the rocks’ answer. Now it’s time to check: who got it right? If the people and the rocks both get it right or wrong, there is no change in the score. If only one gets the answer right, advance the human pawn or the rock on the score track. Whoever reaches 3 correct answers first wins, answering the age-old question: Are you dumber than a box of rocks? The trivia cards are easy to read, and artfully printed to look as if someone mutilated a standard deck of playing cards. Each answer comes with a short explanation, which can soften disputes over the rightness of the answer. Box of Rocks is surprisingly engaging and fun. Unlike many trivia games, it doesn’t set the players up against each other; instead, anyone who answers the question is competing against the rocks. Since the pool of possible answers is so small and cooperation is encouraged, younger or less-knowledgeable players don’t feel penalized. They can guess and still be right about a third of the time! Parents can even talk through their thoughts with their kids, which is a great opportunity to teach sound reasoning and logical progression skills. Of course, there is also the obvious humor value. No one wants to be “dumber than a box of rocks”, and yet the rocks may still win. The Family Gamers give Box of Rocks a solid 9/10. Find it at the Haywire Group website or at your friendly local game store. 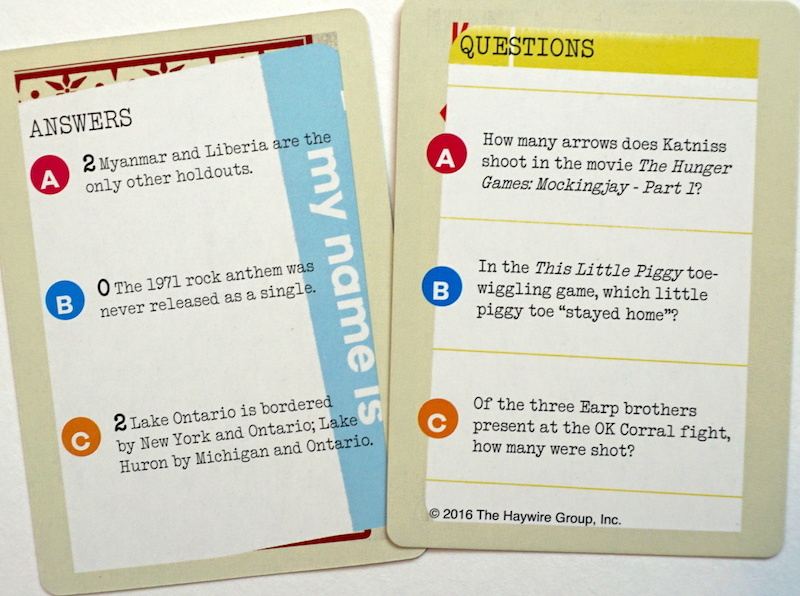 Another offering from Haywire Group, The Parent Quiz turns the trivia concept around. Instead of hard facts about distant people and places, kids find out how well they know their parents (or other friends and family). The adult picks a question card and reads it out loud to the family. Each question has 5 choices for the answer – but one is “YOUR ANSWER”, for which the reader should substitute their real answer (if the real answer is not covered by one of the other 4 choices). We enjoyed The Parent Quiz. Sometimes the answers were easy for our kids to guess (“my favorite midnight snack is…”) and sometimes they were surprised by the answers (“my all time hated chore to do when I was young was…”) It’s a great way to spend a few minutes getting to know each other better through games, which we at The Family Gamers always endorse. One minor quibble with The Parent Quiz: There are only 50 question cards, and some of them are very similar. We won’t be able to play this many times with our kids before they know all the right answers for both parents; but at only $5, it’s still worth picking up. Hands down, this is a great game to give to families to encourage them to connect. Update January 2019: The Haywire Group has partnered with University Games to re-release Box of Rocks – now known as Are You Dumber Than a Box of Rocks. Same great gameplay, now available on Amazon! The Family Gamers were provided review copies of Box of Rocks and The Parent Quiz by The Haywire Group. Re-release: Are You Dumber Than a Box of Rocks?